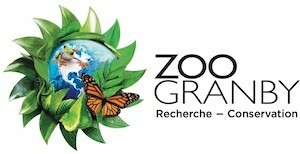 Montreal, September 3, 2014 — Thanks to a new partnership between Concordia University and the Zoo de Granby, master’s students in biology (behavioural ecology and conservation) at Concordia now have the rare opportunity to study animal behaviour with the goal of ensuring their wellbeing. Acting as a living laboratory, the Zoo de Granby is providing students with the opportunity to observe wildlife from around the world in a single environment. Robert Weladji, associate professor in the Department of Biology, has been working with the Zoo de Granby for five years. Although he has had students spend time researching there in the past, Weladji wanted to formalize an agreement to provide a higher level of collaboration over an extended period of time, giving priority to training graduate students. The Concordia-Zoo de Granby Initiative in Ecology, Conservation and Welfare of Captive Wildlife, is a five-year partnership that sees both parties reaping rewards. Funded equally by Concordia and the Zoo de Granby, the partnership ensures that at least four graduate students will receive financial support over the course of research partnership. The first student to benefit is Emily Anderson, a master's student in biology. For most of the summer, she has been observing and collecting data on the zoo's Japanese macaques soon to be moved to a more natural-like habitat. “This will allow us to compare the behaviour of the same group of individuals in two different habitats, which is relatively uncommon, and we will be able to see if there are changes in their activity and whether these changes suggest improved welfare,” she says. “As for the zookeepers, the research will help guide their daily routine and will give them advice on how to improve the interaction between the animals in captivity, their habitat and visitors to the Zoo,” concludes Paré.